"A week doesn't go by where I don't pull How to Cook Everything down from the shelf, so I am thrilled there's a new, revised edition. My original is falling apart!" "This new generation of How to Cook Everything makes my 'desert island' cookbook choice jacked up and simply universal. I'll now bequeath my cookbooks to a collector; I need only this one." "Mark Bittman has done the impossible, improving upon his now-classic How to Cook Everything. If you need know-how, here's where to find it." "Mark Bittman is a great cook and an incredible teacher. In this second edition, Mark has fine-tuned the original, making this book a must for every kitchen." "Throw away all your old recipes and buy How to Cook Everything. Mark Bittman's recipes are foolproof, easy, and more modern than any others." "Generous, thorough, reliable, and necessary, How to Cook Everything is an indispensable reference for both experienced and beginner cooks." "I learned how to cook from How to Cook Everything in a way that gives me the freedom to be creative. This new edition will be my gift to new couples or for a housewarming; if you have this book, you don't really need any others." 2000-07-05. New. Ships with Tracking Number! INTERNATIONAL WORLDWIDE Shipping available. Buy with confidence, excellent customer service! 2003-04-08. New. Ships with Tracking Number! INTERNATIONAL WORLDWIDE Shipping available. Buy with confidence, excellent customer service! 2003-01-02. New. Ships with Tracking Number! INTERNATIONAL WORLDWIDE Shipping available. Buy with confidence, excellent customer service! 2008-10-03. New. Ships with Tracking Number! INTERNATIONAL WORLDWIDE Shipping available. Buy with confidence, excellent customer service! 2003-02-03. New. Ships with Tracking Number! INTERNATIONAL WORLDWIDE Shipping available. Buy with confidence, excellent customer service! 2003-09-02. New. Ships with Tracking Number! INTERNATIONAL WORLDWIDE Shipping available. Buy with confidence, excellent customer service! 2006-02-05. New. Ships with Tracking Number! INTERNATIONAL WORLDWIDE Shipping available. Buy with confidence, excellent customer service! 2005-02-08. New. Ships with Tracking Number! INTERNATIONAL WORLDWIDE Shipping available. Buy with confidence, excellent customer service! 2003-05-08. New. Ships with Tracking Number! INTERNATIONAL WORLDWIDE Shipping available. Buy with confidence, excellent customer service! 2009-07-15. Good. Ships with Tracking Number! INTERNATIONAL WORLDWIDE Shipping available. May not contain Access Codes or Supplements. May be ex-library. Shipping & Handling by region. Buy with confidence, excellent customer service! 2006-08-05. Good. Ships with Tracking Number! INTERNATIONAL WORLDWIDE Shipping available. May not contain Access Codes or Supplements. May be ex-library. Shipping & Handling by region. Buy with confidence, excellent customer service! Houghton Mifflin Harcourt. Hardcover. 0764578650 Special order direct from the distributor . New. Houghton Mifflin Harcourt. Hardcover. 076456756X New Condition. . New. Houghton Mifflin Harcourt. PAPERBACK. 0471789186 New Condition. . New. Wiley. PAPERBACK. 0764525131 New Condition. . New. Wiley. PAPERBACK. 076452514X New Condition. . New. Wiley. Hardcover. 0764570145 New Condition. . New. Houghton Mifflin Harcourt. PAPERBACK. 0764525123 New Condition. . New. Wiley. Hardcover. 0764562584 New Condition. . New. Wiley. Hardcover. 0028610105 New Condition. . New. 2003-05-08. Good. Ships with Tracking Number! INTERNATIONAL WORLDWIDE Shipping available. May not contain Access Codes or Supplements. May be ex-library. Shipping & Handling by region. Buy with confidence, excellent customer service! 2003-02-03. Good. Ships with Tracking Number! INTERNATIONAL WORLDWIDE Shipping available. May not contain Access Codes or Supplements. May be ex-library. Shipping & Handling by region. Buy with confidence, excellent customer service! 2005-02-08. Good. Ships with Tracking Number! INTERNATIONAL WORLDWIDE Shipping available. May not contain Access Codes or Supplements. May be ex-library. Shipping & Handling by region. Buy with confidence, excellent customer service! Andrews McMeel Publishing, 2008-09-01. Calendar. Good. 2003-04-08. Good. Ships with Tracking Number! INTERNATIONAL WORLDWIDE Shipping available. May not contain Access Codes or Supplements. May be ex-library. Shipping & Handling by region. Buy with confidence, excellent customer service! 2000-07-05. Good. Ships with Tracking Number! INTERNATIONAL WORLDWIDE Shipping available. May not contain Access Codes or Supplements. May be ex-library. Shipping & Handling by region. Buy with confidence, excellent customer service! Houghton Mifflin Harcourt. Hardcover. 0764578650 Please allow 4 - 14 business days for Standard shipping, within the US. Thank you for supporting our small, family-owned business! . New. 2008-10-20. 2. Houghton Mifflin Harcourt. Hardcover. 0764578650 Please allow 4 - 14 business days for Standard shipping, within the US. Thank you for supporting our small, family-owned business! . Fine. 2008-10-20. 2. 2008-10-03. Good. Ships with Tracking Number! INTERNATIONAL WORLDWIDE Shipping available. May not contain Access Codes or Supplements. May be ex-library. Shipping & Handling by region. Buy with confidence, excellent customer service! Houghton Mifflin Harcourt. PAPERBACK. 0471789186 Special order direct from the distributor . New. Houghton Mifflin Harcourt. Hardcover. 076456756X New Condition *** Right Off the Shelf | Ships within 2 Business Days ~~~ Customer Service Is Our Top Priority! - Thank you for LOOKING :-) . New. John Wiley & Sons Inc. Like New. Completely Revised Tenth Anniversary Edition. 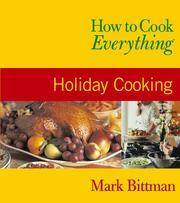 "Bittman Has Added Hundred Of New Dishes, And Completely Updated The Remaining Recipes And Every Line Of Guidance. New Features Abound: Each Chapter Now Opens With Essential Recipes, A Section That Highlights The Core Dishes For Every Cook's Repertoire." . Fine. Hardcover. Revised Edition. 2008. 2006-02-05. Good. Ships with Tracking Number! INTERNATIONAL WORLDWIDE Shipping available. May not contain Access Codes or Supplements. May be ex-library. Shipping & Handling by region. Buy with confidence, excellent customer service! 2003-09-02. Good. Ships with Tracking Number! INTERNATIONAL WORLDWIDE Shipping available. May not contain Access Codes or Supplements. May be ex-library. Shipping & Handling by region. Buy with confidence, excellent customer service! 2003-01-02. Good. Ships with Tracking Number! INTERNATIONAL WORLDWIDE Shipping available. May not contain Access Codes or Supplements. May be ex-library. Shipping & Handling by region. Buy with confidence, excellent customer service! Wiley. Hardcover. 0764570145 New Condition *** Right Off the Shelf | Ships within 2 Business Days ~~~ Customer Service Is Our Top Priority! - Thank you for LOOKING :-) . New. Houghton Mifflin Harcourt. Hardcover. 076456756X Like New Condition. . Fine. Wiley. Hardcover. 0028610105 Like New Condition. . Fine. Wiley. Hardcover. 0764570145 Like New Condition. . Fine. Wiley. PAPERBACK. 0764525131 Like New Condition. . Fine. Houghton Mifflin Harcourt. PAPERBACK. 0471789186 Like New Condition. . Fine. Wiley. PAPERBACK. 076452514X Like New Condition. . Fine. Wiley. PAPERBACK. 076452514X New: Packaged Carefully & Shipped Promptly. 100% Satisfaction Guaranteed! . New. Houghton Mifflin Harcourt. PAPERBACK. 0764525123 Like New Condition. . Fine.